FEATURED PHOTO AND PET: BEAUTIFUL WEDGES AND ROMEO THE DOG - What About Watermelon? I’m big on watermelon images as my computer wallpaper. While everyone else has photos of family pets or their favorite sports team, I’m displaying images of juicy Desert Kings and Royal Jubilees. Oh well, to each his own. The image above is my current wallpaper. Has been for about two weeks now. I find it somewhat mesmerizing. Check this website to get a large version for yourself. As you might have already known, humans aren’t the only ones who love watermelon. All sorts of animals love it too, including (and perhaps especially) dogs. Below is a shot of a fella named Romeo. As you can see, Romeo loves his watermelon and I’m guessing he really loves his generous owner too! 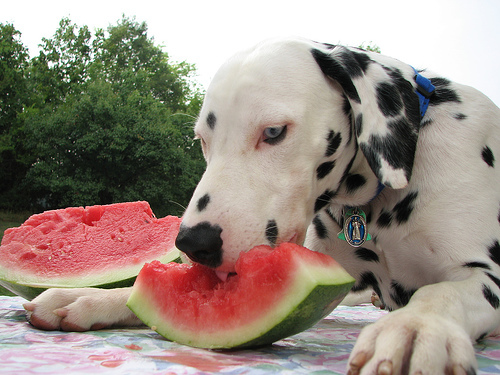 Judging by how many photos there are online of dogs chowing down on watermelon, it seems like dogs really like it. Does anyone else have a dog that eats watermelon? UP NEXT: Can you eat watermelon seeds? Very cool, Eddie! Looks like it was a lot of fun (and for a good cause).